Which school do you want to support? Chaos and learning don't generally mix well. How can schools reduce bullying? What kind of school discipline works? How can teachers learn to keep order in the classroom? Is corporal punishment legal in California? Is "zero tolerance" effective in school discipline? Are schools becoming more dangerous? Discipline is a critical element of a functioning school, and international research suggests that order in the classroom is an essential quality for an effective place for learning. Some teachers are masters at bringing their classes to order, and their techniques are worthy of study. Doug Lemov's book Teach Like a Champion offers practical tips based on successful teachers. The New Teacher Center (a Full Circle Fund grant recipient) helps train coaches for new teachers, who may struggle to establish order in their classroom. Learning the techniques of classroom control is a part of most teacher induction programs. When kids get into trouble at school, teachers must decide how to respond. Should they ignore it? When kids get into trouble at school, teachers must decide how to respond. Should they ignore it? Should they call a parent? Should they call in the principal or another school leader? Should the student sit in the corner, or in another room? Each case is different, and the range of responses can be enormous. Schools and districts create discipline policies to help teachers respond acceptably and to communicate with students and parents about behavior expectations and the consequences for bad behavior. In most states of the south, the range of responses for school discipline may still include spanking, slapping and other forms of corporal punishment. Proponents of these practices, which are prohibited under California law, argue that they serve an effective deterrent purpose, and that administering them is less damaging to students than suspension or expulsion, which remove students from the learning environment. Opponents argue that inflicting physical pain is barbaric and sets a bad example for conflict resolution. In order to have some way of creating consequences for bad behavior, some schools (and many more teachers) create positive reward systems for good behavior, such as special recognition, in-class movies and the like. Withholding such incentives can help create consequences that students care about. Danger in the classroom: Zero tolerance? For those interested in learning more, the California Legislative Analyst Office's primer on California's Criminal Justice System is a helpful source. This isn't to say everything is dandy, of course. Bad stuff happens to kids, and some of it happens in school. The US National Center for Education Statistics (NCES) collects data about school safety and crime. The data are eye-popping. For example, the 2015-16 survey indicated that a crime had happened at more than three quarters of schools and nearly half of schools had reported an incident to police. The "violent incident" rate was 17 per 1,000 students, with 4 per 1,000 reported to police. In the 2015 survey about 4% of girls aged 12-18 reported that they were "sometimes" or "almost always" afraid that someone would harm them at school, with the rate highest for the youngest respondents. The long-term trend is strongly in the right direction, but a rate of 4% represents half a million girls in America who feel afraid at school. Teachers don't necessarily feel safe at school, either. In a 2011-12 survey more than 7% of teachers in California reported having been physically threatened by a student, and more than 4% reported having been physically attacked. Sometimes things get out of hand, and students fight. In California, schools are gun-free zones. Under a policy called zero tolerance, federal law requires that students who bring guns to school be expelled. Like many other states, California also has zero tolerance for additional offenses, such as brandishing a knife, possessing controlled substances, and sexual assault. At the time that these mandatory expulsion laws were passed, states often added additional provisions that gave local districts the option to suspend or expel students for a variety of other offenses. Districts in turn adopted their own policies and approaches related to “zero tolerance” in an effort to assure that schools are safe and based on the theory that stringent behavior codes would work to prevent the most serious misbehaviors. Unless a student's misbehavior requires police involvement, a school's main official disciplinary options are detention, suspension, and expulsion. In 2011, the Justice Center and PPRI sponsored "Breaking Schools' Rules," an extensive analysis of empirical data about disciplinary practices in the state of Texas. The report quantified what many suspected: boys end up in trouble in school more often than girls, and black and Latino students end up in trouble more often than white and Asian students. Detentions, suspensions and expulsions do harm. Vigorous and fair enforcement of rules seems like a good idea, but there is disappointingly little evidence that zero tolerance improves outcomes for students. In fact, there is a growing consensus among educators that detentions, suspensions and expulsions do harm. Removing young people from the active learning environment may turn those students toward permanent school failure without making schools safer or more effective. Responding to these findings, schools in California are strongly reducing the use of suspension in school discipline. Still, the amount of school missed for discipline cases is still pretty massive. 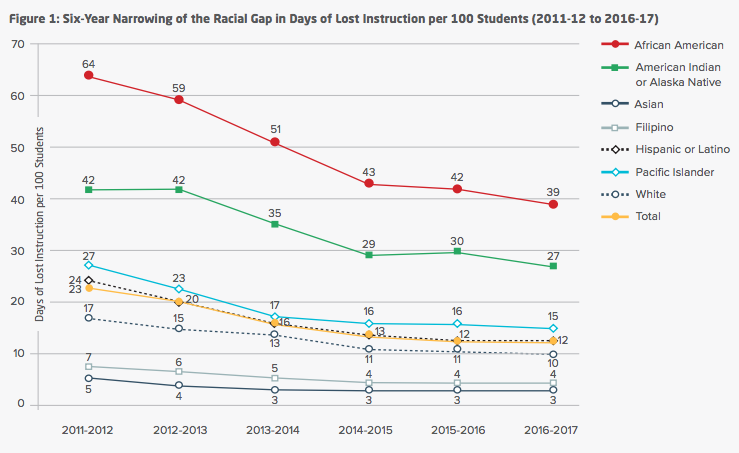 According to data assembled by the Center for Civil Rights Remedies, "In 2016-17, schoolchildren in California lost an estimated 763,690 days of instruction time, a figure based on the combined total of 381,845 in-school suspensions (ISS) and out-of-school suspensions (OSS)." A growing chorus of researchers, educators, and advocates say that alternatives to zero tolerance do more to result in safe, orderly campuses. They argue that students can and should be explicitly taught how to behave in the school setting, even under provocation. They make the case that a more flexible approach to discipline can keep a much greater number of students in school and out of the juvenile justice system. A 2008 report from the American Psychological Association (APA) set out principles to guide local schools and districts toward more effective discipline policies.The report takes the position that local policies should make it absolutely clear to students, staff, and parents that certain behaviors or offenses are unacceptable under any circumstances. —Expulsion is reserved for only the most serious offenses that place other students or staff in jeopardy of physical or emotional harm. —Focus is on keeping students in an active learning environment, even in a separate facility if necessary. —Teachers/staff have discretion in handling all but the most serious or serial infractions, using a clear method for making appropriate discipline choices with escalating options. —The disciplinary policy provides guidance to school personnel regarding permissible or recommended consequences for a given severity of behavior. —Behaviors subject to disciplinary action are carefully and clearly defined. —Local communities institute systems in which education, mental health, juvenile justice, and other youth-serving agencies collaborate to develop integrated services. Behavior programs aim to modify an area of behavior for a specific age-group. Some are preventative programs for all children and others work as interventions. Restorative justice and Positive Behavioral Intervention Systems (PBIS) are two common examples. The research literature also makes a strong case that parents and community members have a strong role to play. All California school districts must include school climate outcome measures beginning with their 2014-15 Local Control Accountability Plan (LCAP). All California school districts must include school climate outcome measures in their Local Control Accountability Plan (LCAP). The required indicators include pupil suspension and expulsion rates, to which local measures of safety and school connectedness can be added. Organizations such as the Ella Baker Center (a Full Circle grant recipient) provide a valuable public service by intervening to help at-risk kids stay in school and out of trouble. Full Circle has also supported the Niroga Institute, which has studied approaches to reducing school violence and conflict by teaching students techniques of self-control through the practice of yoga. This lesson concludes this chapter on "places for learning." The next chapter examines the "stuff" of learning, including curriculum, assessments, technology, and more. Updated July 2017, June 2018, October 2018. School safety and order is a part of the "climate" of a school. If a student brings a gun to school, what disciplinary options does the school leadership have? Answer the question correctly and earn a ticket. The alternatives to suspension especially (you have been chronically tardy, so we'll suspend you from school, has seemed an inane approach forever), are especially important to develop. Anything that will get the student back on the learning track is welcomed. Tardiness has to be deconstructed (some kids are chronically tardy because their parents can't or won't make the effort, other kids are late or ditching school altogether). Students who disrupt a class are a different kettle of fish--what is driving the disruptiveness has to be deconstructed carefully: an undiagnosed learning disorder? awful home situation? underlying ailment such as hypoglycemia? needing a different learning environment? Thanks Susannah, I think your comment really illustrates the complexities that California teachers face in the classroom. Leading a successful class is a breeze when you have a room full of...robots. But these are children who all come from homes and backgrounds that can differ dramatically even within the same zip code. We ask A LOT from our teachers in addition to actual teaching. Giving them the training and support to keep as many kids as possible in their classroom and learning certainly seems like a step in the right direction. Zero-tolerance policies are *supposed* to provide clarity and ensure that rules are enforced equally for all groups. However spend enough time in school and you will experience something silly because of zero tolerance policies. On the one hand we seem to want to take judgement away from school leaders in case they made the wrong call... But on the other hand this sometimes means that they are constrained from making the right call. EdSource kicked off an informative three-post series on Restorative Justice in May 2018. I liked the first of the three posts particularly for the way it illustrates one of the themes of Ed100: education is by nature a personal undertaking, but education systems in California have to operate at massive scale. It's hard to scale up the soft-skills aspect of things that happen in classrooms. EdSource provides a way to look up California Suspension and Expulsion Rates. In California and other states, rates of student suspension have plummeted. As usual when there is a sharp change in a statistic about education, it's a good idea to squint at the data. The big change has more to do with policy than with the underlying reality. Suspensions are out of fashion as a penalty for misbehavior, for reasons that are based in logic: kicking students out of school might not help them. But the research on the overall impact of this policy shift is unclear. Does dialing back the use of suspensions make misbehavior worse? T74 summarizes the debate over whether "restorative justice" practices work. I would like to see a separate lesson on the topic of school safety for situations such as: Lock Down, Wind Storms, Earthquake. Discipline is somewhat related to safety in my opinion, but there are major gaps with respect to child safety protocols at school. Should You Have a Choice of Schools? Could Schools Do More Than Educate? What Does a School Look Like? What Makes a School Good? Why Not Teach All Kids Alike?